Accounts are already entered in the era of digitalization. Start from manual pen & paper to Excel sheets finance has reached cloud technology. The era of spreadsheets and desktop accounting software not finished yet, but still businesses are rapidly adopting cloud account management software. This adoption has wide-range of reasons i.e. simplicity, automatic tasks and easy access etc. There is no doubt it has fueled the business towards continues growth. Along with technological changes, the job description of accountants has also been changed. Companies are now, want finance heads with more responsibilities. They’re expecting to have transaction as well as investment suggestions, improvement tips and much more. Businesses are also looking to have experts that invest time and support in resource management too. The market wants the accounts managers to upgrade their skillset and learn updated technologies. So, in order to manage all these expectations, traditional accounts management system or manual procedure are seems more critical to managing. It increases the workload and robs the productive hours that could be better utilized for other tasks. Here we have enlisted major reasons that encourage to avoid traditional software and take your accounts to next level. For an accountant, tax season is always full of stress. They work need to work around the clock for tax return files preparation along with detailed financial reporting. Cloud based accounts management software is specially designed by keeping such scenario in consideration. They automatically generate different reports i.e. statements, balance sheets, ledgers and cash flow data with one click. It also allows you to generate a yearly report with automatic tax calculations. 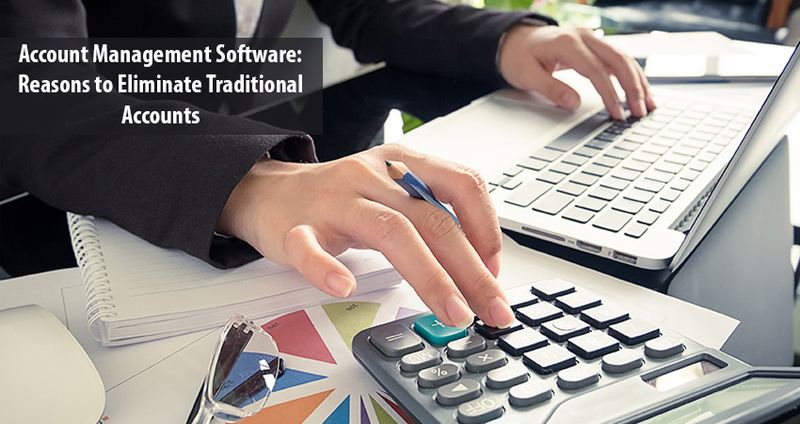 Traditional accounting software needs to enter all of the records manually and individually to the system. While cloud technology is available with bank integrated system. All of the transaction history and invoice data will be automatically fetched and make your day. It saves the significant time of your accountants and secures your business from human errors. Cloud technology is facilitating the businesses with comprehensive reporting not just accounts overview but sales & purchase record. You’ll be able to know about all or the products as well as customers. It significantly highlights your best customers. Reporting data can be easily sliced and the required information will be in your hand. The dashboard of cloud based account management software will share finance summery in a bird’s eye view. Desktop accounting software needs a specific license that is required to update and execute them. These licenses are limited for one or two systems. While cloud finance software is easy to collaborate and accessed by different authorized users. It can be controlled by the administrator and utilized by multiple users at the same time from different locations. The traditional desktop accounts solution were specified for some device. In order to access any sort of information, you’ve to use that system. While cloud keeps you free. You can access all of the accounts data anytime with no restriction of place and system. Moreover, it can also be accessed through your mobile devices. So, no need to stick to your seat. There is a rumor that your data is not secure in the cloud. This is just a rumor. In traditional desktop software, in case of physical damage, the chances of data loss were hired. Let’s assume your system is crashed or attack by some virus, all of the data may damage. Therefore, companies, couldn’t stop manual entry. In the cloud, all of your data is already secured and any damage to your physical machine is not going to harm it. It offers automatic data backup with almost 99.99% uptime. All of the financial records are available around the clock. If we talk about desktop accounting software, you have to invest at different levels. Initially, there is a need to invest in the latest software. It needs to consume hours on updating system. Every time while updating the software, you’ve to invest time and money. In cloud based account management software, the company releases the updates and system will be invisibly upgraded from the backend. No need to spend additional hours. These are the few major benefits highlighted here that encourages the business to adopt cloud solutions. Furthermore, reconciling, simple interface and user-friendliness are also need to understand. Whether you need to execute hundreds or thousands of transactions. Automatic calculation ensures that there will be not even a single mistake. Manual reconciliation consumes a lot of time and still, the error of mistake remain there. Cloud account management software allows you to set your own rules and take charge in your own hand.